Three teams from Oxygen House competed in this year’s 10km Marine Commando Challenge and took top position in both the male and vets events. This Sunday saw the 22nd Marine Commando Challenge – a gruelling 4.5k road race followed by 2.5k of tunnels, mud and water-based obstacles, followed by another 4.5k road race back to the start. The 8 Assassins and the ATASS Honey Badgers took first and second position in the male and vets categories, whilst the Malayan Tapirs comprising Select’s own Steve and Lynsey together with Georgie and Gemma from Sparx and Grace from ATASS Sports came a respectable 5th in the vets and 4th in the mixed categories. They were just £70 shy of pole position in the mixed competition. In total, the three teams raised nearly £5000 in sponsorship to support Devon Air Ambulance and the Royal Marines Charitable Trust Fund. Commando Challenge veteran Steve said “the competition seems to get tougher each year and, after competing for four consecutive years, I still don’t understand how it can be uphill both there and back!”. 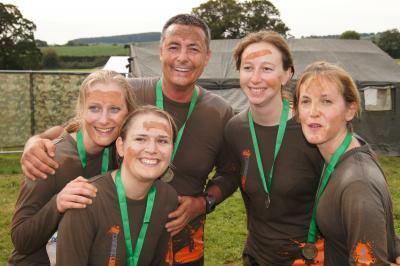 Virgin competitor Lynsey said “Mud, tunnels and the sheep dip, not exactly a normal Sunday morning but loads of fun!”. All three teams are keen to compete again next year and there’s even talk of entering the 17km race in June.